As a Jacksonville criminal attorney, I have had many clients that were stopped for a traffic infraction and then arrested for something else. For instance, a person may be stopped for speeding. The police officer goes to issue a Florida speeding ticket and sees a small amount of marijuana. The police officer searches the car and finds other illegal drugs. The driver is arrested for Jacksonville possession of a controlled substance and possession of cannabis. Another common example applies to Jacksonville driving with a suspended or revoked license cases. The police officer may run the tag of a vehicle and see that the owner of the car has a suspended license in Florida. The driver appears to fit the description of the car’s owner. The police officer stops the car. He sees that the driver is a Florida habitual traffic offender and arrests her. Many Jacksonville driving under the influence cases also begin with a basic traffic stop. The police officer may pull the car over for an expired tag and suspect that the driver is impair by alcohol. The driver is later arrested for DUI. (1) Every vehicle, at all times while driven, stopped, or parked upon any highways, roads, or streets of this state, shall be licensed in the name of the owner thereof in accordance with the laws of this state unless such vehicle is not required by the laws of this state to be licensed in this state and shall, except as otherwise provided in s. 320.0706 for front-end registration license plates on truck tractors and s. 320.086(5) which exempts display of license plates on described former military vehicles, display the license plate or both of the license plates assigned to it by the state, one on the rear and, if two, the other on the front of the vehicle, each to be securely fastened to the vehicle outside the main body of the vehicle not higher than 60 inches and not lower than 12 inches from the ground and no more than 24 inches to the left or right of the centerline of the vehicle, and in such manner as to prevent the plates from swinging, and all letters, numerals, printing, writing, and other identification marks upon the plates regarding the word “Florida,” the registration decal, and the alphanumeric designation shall be clear and distinct and free from defacement, mutilation, grease, and other obscuring matter, so that they will be plainly visible and legible at all times 100 feet from the rear or front. Except as provided in s. 316.2085(3), vehicle license plates shall be affixed and displayed in such a manner that the letters and numerals shall be read from left to right parallel to the ground. 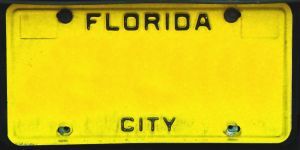 No vehicle license plate may be displayed in an inverted or reversed position or in such a manner that the letters and numbers and their proper sequence are not readily identifiable. Nothing shall be placed upon the face of a Florida plate except as permitted by law or by rule or regulation of a governmental agency….